Music Charts Magazine® logo proudly flies high on the Nasdaq MarketSiteTower in New York City’s world famous Times Square. 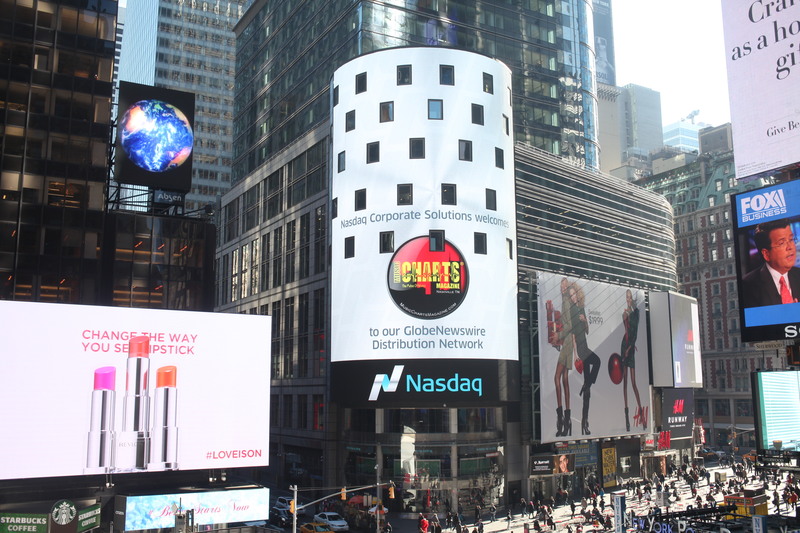 “Nasdaq Corporate Solutions welcomes Music Charts Magazine® to our GlobeNewswire Distribution Network” lit up the Big Apple’s Times Square on November 24th during the lunchtime hour. Music Charts Magazine® is an online company providing music’s greatest legends a place to call home. Music Charts Magazine® provides music industry news, celebrity interviews, reviews and more. With an emphasis on obtaining and maintaining music history, Music Charts Magazine® produces one-of-a-kind interviews with celebrity musicians. The audio interviews can be heard now at www.MusicChartsMagazine.com. Large public corporations, small businesses, professional organizations and PR agencies have one thing in common – they rely on Nasdaq’s press release distribution service—GlobeNewswire—to broadcast their company news to a worldwide audience in a time-efficient and cost-effective manner. Nasdaq GlobeNewswire distributes to specialized markets and media outlets, focusing in the delivery of corporate press releases, financial disclosures and multimedia content to the media, investment community, individual investors and the general public. Music Charts Magazine is a registered trademark, a C-Corporation and rated “A+” by the Better Business Bureau.